Staff Correspondent, Tangail: Three people were killed as a vehicle rammed a CNG run auto-rickshaw at Hatia under Kalihati upazila on Friday morning. One of the deceased was identified as Sabur Mia, 35, the CNG run auto-rickshaw driver and son of Akter Ali of Sarpolisha in Bhuapur upazila while the identities of two others could not be known immediately. 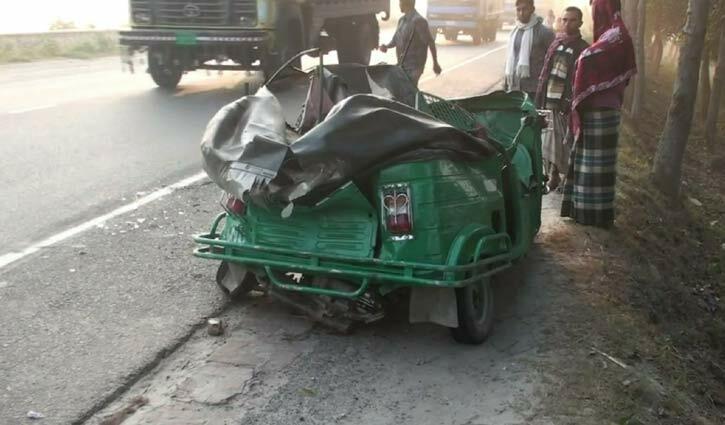 Officer-in-Charge of Bangabandhu Bridge East Police Station Mosharaf Hossain said the accident took place in the morning at Bangabandhu Bridge East Link Road when a North Bengal- bound vehicle hit the CNG run auto-rickshaw, leaving its driver dead on the spot and two passengers injured. The injured were taken to Tangail General Hospital where the doctors declared them around 9.00am.